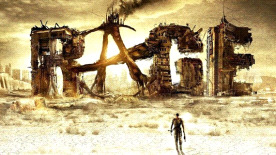 RAGE® © 2011 id Software LLC, a ZeniMax Media company. Bethesda, Bethesda Softworks, ZeniMax and related logos are registered trademarks or trademarks of ZeniMax Media Inc. in the U.S. and/or other countries. RAGE, id, id Software, id Tech and related logos are registered trademarks or trademarks of id Software LLC in the U.S. and/or other countries. Uses id Tech® 5. Copyright © 2011 id Software LLC. All Rights Reserved.